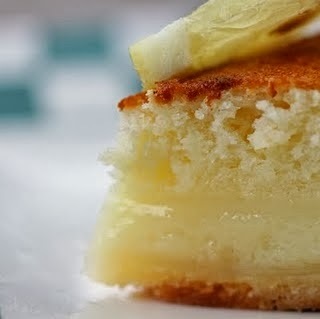 This super-easy pie bakes into a light (almost angel-food-like) cake on top of a creamy custardy crust-full-of-yummy-ness! Put rack on lowest position in oven. In a medium bowl, stir together melted butter and sugar. Stir in flour, salt, lemon peel and lemon juice. In a small bowl, beat egg yolks with milk until well blended, stir into lemon mixture. In another medium sized bowl, beat egg whites with an electric mixer until they hold distinct but moist peaks. Gently fold egg whites into lemon mixture. (Don't mix it too much.). I always end up with more filling than will fit in the pie crust so I put it in a couple ceramic ramekins and cook it along with the pie. Bake on the lowest rack of the oven until the top is browned and the center jiggles only slightly when pan is gently shaken (45-55 minutes). If the crust begins to brown excessively, drape it with foil. Let cool before serving. But it's good warm too!